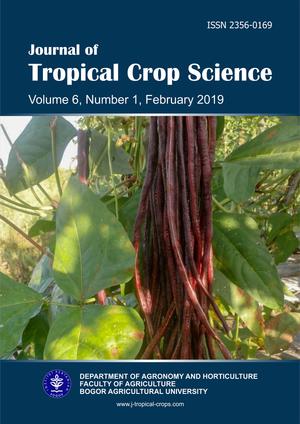 Welcome to the online submission and editorial system of Journal of Tropical Crop Science. Journal of Tropical Crop Science is an international journal publishing research related to tropical crops. Articles in the journal focus on in-vivo and in-vitro production and production environment, breeding, seed technology, physiology, postharvest, pest and pathology of cereals, vegetables, fruits, ornamentals, medicinal and plantation crops; soil, landscape, turf and agro ecology management under tropical conditions. Original research papers should report the results of original research. The material should not have been previously published elsewhere. Review articles should cover a part of the subject active current interest. They may be submitted or invited. Original research paper and review articles should have a maximum of 10,000 words, including figures and tables. Short Communications include report of preliminary research results, newly developed methodology or modification of existing methodology, and results of the application of an earlier published research methodology on other crops or under different conditions. Short communications should be as completely documented, both by reference to the literature and description of the experimental procedures employed, as a regular research paper with a maximum of 2000 words, including figures and tables. AGRIS, a worldwide cooperative by the Food and Agriculture Organisation of the United Nations (FAO) with open archives and bibliographical databases covering various aspects of agriculture, including forestry, animal husbandry, aquatic sciences and fisheries, and human nutrition. World Catalogue Library, the world's largest network of library content and services.